NBC: The season (and probably series) finale of MIDNIGHT, TEXAS was steady with last week’s 0.4. A rerun of AMERICA’S GOT TALENT followed at 0.5, and DATELINE was up 0.1 to 0.6. ABC: After an hour of sitcom reruns at 0.4/0.3, a 2-hour 20/20 was down 0.1 to 0.4. 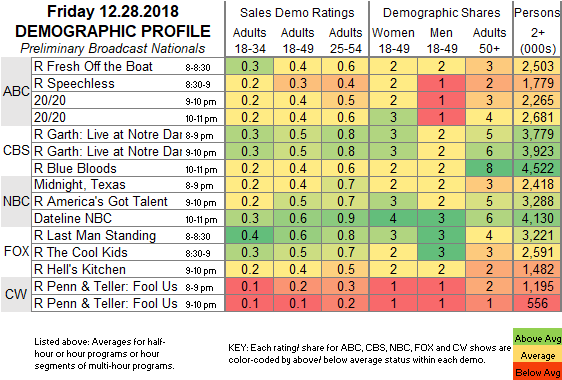 CBS: A rerun of GARTH: LIVE AT NOTRE DAME at 0.5 was followed by a BLUE BLOODS rerun at 0.4. Primetime tonight will likely be dominated by ESPN’s evening COLLEGE FOOTBALL PLAYOFFS game. On Sunday, FOX will boost the season premiere of THE ORVILLE with an off-night airing after the afternoon Week 17 national NFL game. CABLE RATINGS: Come back Monday afternoon for detailed demographic ratings for top cable programs from this day.